Paramount oversees the receipt, issuance, handling and tracking of cargo and equipment coming through Trinidad's ports, offering safe storage in one of our many warehouses and delivery to the job-site. We expedite shipments through customs and obtain clearance at ports. 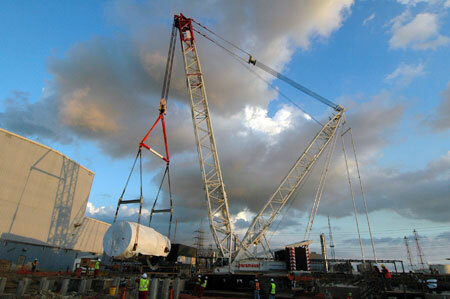 Extensive lifting and engineering plans are required when transporting abnormal and heavy loads. Imaginative solutions and comprehensive planning are essential. Our engineering teams face the challenge of moving outsized objects through industrial or civic areas on tight schedules while staying in budget. Paramount has the manpower and equipment to complete any job. If we do not have the tools on hand, we will acquire new equipment for any project that calls for it. We have several acres of secure storage space. Our warehouses and open-storage yards are strategically located near Trinidad's ports and industrial parks. Each stored item is carefully labeled and filed for easy tracking and access. Through PTT Contractors Limited, a subsidiary of Paramount, we specialize in, but not limited, to Earthworks and Civil Construction. The expertise of this company allows Paramount to have a Total Project Management stance in which we take full responsibility for all stages of planning, scheduling and logistics. Paramount has the technical and physical capabilities to meet and surpass any transportation requirements of our clients, both locally and internationally. Paramount Transport has the finest, largest and most modern fleet of specialized equipment in the Caribbean. Our equipment is continually updated and can reinforce our reliability on the job. All equipment is available for rental or lease. Additionally, we supply experienced and fully certified crews to operate rental cranes, trucks and lifts, thereby guaranteeing compliance with OSHA regulations as well as to our stringent in-house safety standards. Each machine is certified and fully insured. We also provide immediate repair and replacement in the event that any glitch should arise during the rental period.